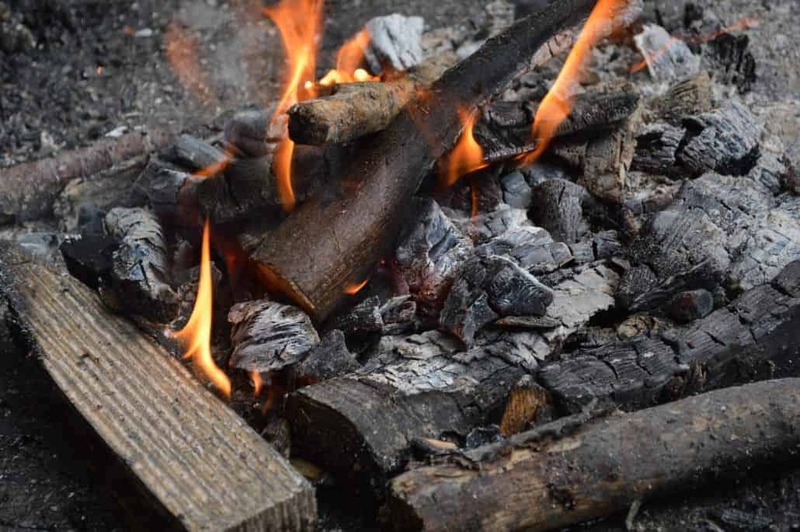 Charcoal has a huge variety of uses, from purifying drinking water, building a fire, a dye, making your own ink and has even been used as medicine. You can also use it to dehydrate something in order to preserve it. In bushcraft of course, the most common use for charcoal is to build a campfire. But you don’t need to head to the shops to get it, making charcoal is quite easy. Very simply, charcoal is wood that has had all the unstable compounds burned out of it, leaving carbon behind. Carbonizing wood requires fire and the ability to cut air off from that fire. This means the fire will go out after absorbing the volatile compounds, but will not entirely consume the wood. Once the fire goes out, you are left with charcoal. – By using a pit where the fire gradually builds up and then smothered. – In a clamp or pile, which gradually smothers as it burns. – Using a kiln with the charcoal wood in a container. Once surrounded by fire, the volatile gases go into the outer fire to improve the burn. 1. Choose a clear site with no stray roots nearby and build a fire. 2. Find a metal container with a loose-fitting lid. This will act as your cooker. Then cut a small hole in the lid. This is very important because as the wood burns inside the container, it will give off methane gas, which is highly flammable. If you allow the methane to build up too much, it could cause an explosion. Take a coat hanger and wrap it around the container with the hook on the top. This will create a cage, which you can use to easily move the container in and out of the fire. 3. Choose and prepare your wood. You might have to rely on what wood you can find nearby. However, you will need to think about what you plan to use the charcoal for. There are two basic kinds of wood, hardwood and softwood. Hardwood (oak, walnut, hickory, and beech) charcoals tend to burn hotter and hold together well. Softwood (pine, willow or poplar) charcoals are better at absorbing things. 4. You will need to chop the wood into small chips to put into the cooker. Use your axe to split each piece as many times as possible. When you’ve split the big pieces into thin pieces, chop them up into small twig-sized pieces. 5. Put the little pieces of wood into the cooker. Put the lid on and use a stick to move the cooker into the fire. You can also use the stick to make sure the cooker stays right in the flame. As it begins cooking, white smoke will come out of the top hole and under the lid. After a while, this smoke will become highly flammable. Once the smoke stops being flammable, your charcoal is ready. To test this, put a burning stick up to the hole on the top of the container. 6. Take it out of the fire immediately, but do not remove the lid just yet. If the charcoal gets exposed to the air too soon, it will become white ash. Wait for the container to become completely cool before removing the lid. Bend back the loose wire on the cage and pull the container free. Check the contents. There should not be any wood pieces left and very little or no ash. To test it, take a big piece and snap it. You want it to snap easily. To perfect your charcoal making technique, or you are a complete beginner, sign up to our axe skills and charcoal making course, where you will receive hands-on tuition from the experts at Wildway Bushchraft. Get in touch for more information or visit our courses page to find out what else we have in store this year.